Some of us Music teachers are always looking for new music classroom ideas, while regular classroom teachers are looking for ways to incorporate music into their curriculum. 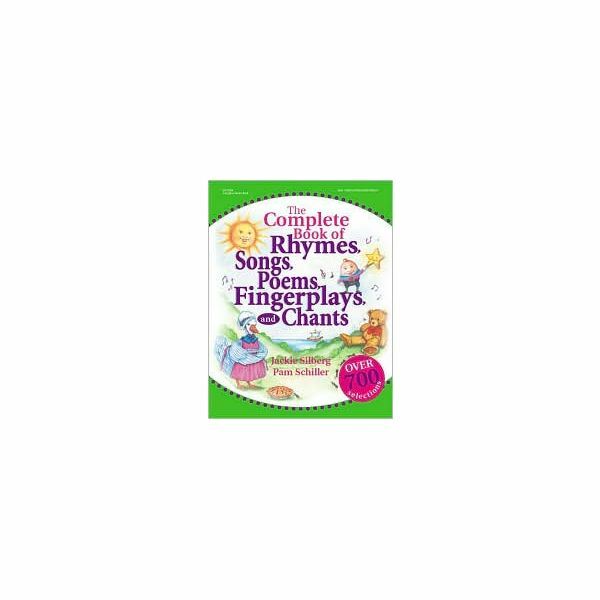 This book, The Complete Book of Rhymes, Songs, Poems, Fingerplays and Chants, is a great elementary or music teacher resource to use in either situation. Your students will enjoy the 700 sections of fun songs, poems, fingerplays, and rhymes that are listed in alphabetical order for easy access. Many of the selections are suitable for children in preschool and up to 2nd grade. (Can be found in the introduction of the text). These songs cover a lot of seasonal topics as well which are great to use all year round. A rationale-I love this feature for it is nice to have to justify to your administrators, other teachers, and especially parents the purpose for using these songs and fingerplays in your elementary music classroom. A categorized index-It lists all the songs by category so if you are looking for songs that fit a particular unit, you are all set. For example, if you are doing a unit on say farm animals, you can look up animal songs, and there will be horse songs, cow songs, chicken songs, etc. If you were doing a unit on healthy foods, you can find all kinds of food songs (i.e. Apple and Bananas) in the index under “Food”. What a like about this book is that it offers a vast array of songs for the classroom on any subject you can really think of. I have used it with my preschool students and kindergarten classes the most for it teaches very basic concepts and contains seasonal songs which they really enjoy singing and acting out. I also like how it provides you with some of the motions to accompany the lyrics and gets my kids moving in the classroom. Some of the songs I even do as warm-ups to my actual lesson for the day and sometimes I use them as a closing activity to just be silly and have fun. I also appreciate that the writers have listed the theme connections under each ditty, it makes it easier to relate to my unit plans and stay organized as well. The one thing I wish was included was the sheet music or chords for every song. As a Music teacher, I am very familiar with most of the tunes, but there are some that I think classroom teachers may have difficulty singing with their students without a little more melodic intervention. Nevertheless, it is a terrific resource for teachers of young students. It can range anywhere from as low as $13.95-$34.95. Overall, this book of songs and children’s fingerplays is a great way to teach both musical and academic concepts to young children. I highly recommend you add it to your Music resource library. Silberg, Jackie. The Compkete Book of Rhymes, Songs, Fingerplays and Chants. Gryphon House. 2002.